Blood Elven Worker skin I made, This skin written to the blood elf peasant model. anyways, give credit to me, 84chrome, if you use my skins. Looks much better from the very first uploaded one. But I strongly suggest to give him a different face at least. But nonetheless, this is approved now. While the parts you changed looks decent you need to change more of the original skin to have this approved. Please review our Skin Submission Rules. Comparing this to the original. You can put a little more effort into it. 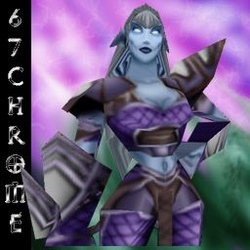 67chrome is just my pattern. you would be a lot more unique if you weren't shadowed by an already great name.. unless you want to match the talent..
You are on the right path But I really think you should change the face. Otherwise there is not much diffrence between the original texture and yours. Main problem is that the face on the elven peasants is lowpoly as sin, even the portrait uses a copy of the priest head instead of a better version of the peasant, so without a custom model, you're asking him for extra work without any noticeable gain. Ok i make more changes soon. There's not much change tho. The gold trim on the waist and the clothing on the body did not match the original color of the skin. Would love this if you made this different from the original. Also regarding the face you could actually change it even if it is lowpoly it just takes hardwork and dedication. Thanks for writing your comment, I'll make more changes soon. making progress on the texture, i see..
Can u make a high elf version as well? Do you have any plans to make this texture different from the original? To be honest, when in game, there's no sign of difference. Awaiting update. soon design a gloves for this skin. Thank you, soon I will start my work on face. I for one think it looks awesome. Wow this one keeps getting better better good job will u make high elf version as well i am really curios ?